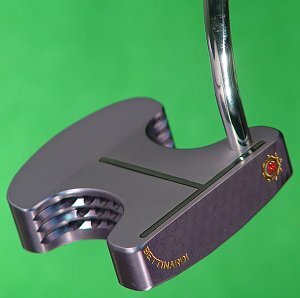 I have a Baby Ben BHB-9 heel shafted putter. I was wondering if I can have this putter reshafted? I'm a big fan of the "straight through" shaft/head style putters, where shaft and putter are on the same plane without bends forward or back. Any recommendations on a replacement shaft? Not sure exactly what you mean.......... if you hold the grip and the face of the putter is not 90deg then the grip is not on straight, or the shaft has been bent/twisted.. If your shaft currently has an intentional bend in it I doubt you can swap with a straight shaft as you are changing the fundamental design of the putter. The angle of the shaft's entry to the putter head cannot easily be changed. Take it to a reputable clubmaker and ask his opinion..... a new shaft/grip won't break the bank and a Bettinardi is always worth restoration. On the BHB-9 the shaft comes out of the clubhead vertically for about a half inch it then has a shallow bend forward towards the centre of the clubhead then the shaft bends back towards the player. it could be bent that way to make the putter face balanced........ ie. if you just balance the putter shaft on one finger you will see the putter face pointing directly upwards. You could also contact Todd Schumaker at WWW.TKSPUTTERS.COM he knows everything there is to know about Bettinardi/Hogan putters.